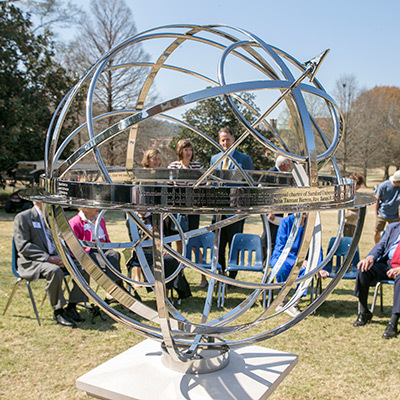 Samford University dedicated a distinct piece of sculpture, an original armillary sphere, and paused to look back at its history during a Founders Circle convocation March 23. The program in Reid Chapel was part of the university’s 175th anniversary being celebrated during a series of programs in 2016–17. The Samford sphere resides on a pedestal near the entrance to Reid Chapel. It was created by renowned British artist David Harber based on a 250 A.D. design. It is engraved with the names of the university’s founders, a verse from the Book of Psalms, and compass points to global destinations that reflect Samford’s academic and spiritual roots. The compass points are Jerusalem, Athens, London, Providence (Rhode Island) and Marion, Alabama. Honored guests included members of Samford’s Founders Circle, alumni and friends who have supported Samford with philanthropic gifts for 35 years or more. Together, these individuals have provided more than $39,822,515 over the years to sustain Samford’s mission. Students and employees also attended. Bass traced Samford’s origin to a movement sweeping the nation in the 1830s and ’40s to establish colleges “to train ministers, teach young people Western and Christian traditions, and provide moral order to the community.” The school was founded in 1841 in Marion, Alabama, as Howard College, named for British prison reformer John Howard. Bass noted that Edwin Davis King played a central role in envisioning the college for young men. He added that Rev. James H. DeVotie, the new pastor of Siloam Baptist Church in Marion, brought new energy to local efforts to start the school. DeVotie and King joined with wealthy businesswoman Julia Barron and New England educator Milo Jewett to begin “making the new male college a reality in Marion,” said Bass. DeVotie and Jewett hired 26-year-old Samuel Sterling Sherman, a Vermont native, “to provide both leadership and a guiding educational philosophy for Howard College.” Sherman drew on his background at Middlebury College to design a curriculum he believed would liberate students “from the shackles of ignorance,” said Bass. Howard College opened to a class of nine on Jan. 3, 1842. “Today, Samford University and Howard College of Arts and Sciences embrace educational programs and an academic vision that remain rooted in the traditions of a liberating education,” said Bass. It includes effective writing, critical thinking, analytical reading, persuasive speaking, innovative problem-solving and the intellectual foundations of Western philosophy and Evangelical Christianity.